Chitose Abe is no stranger to making bold statements relating to our perceptions. Last season the Japanese designer emblazoned the phrase “Truth. 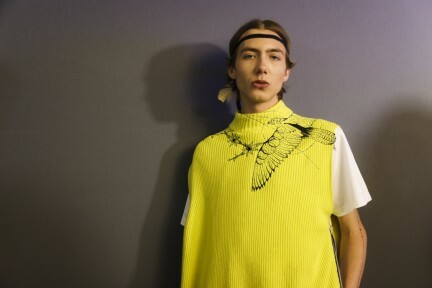 It’s more important now than ever” across t-shirts and sweatshirts, this time round, the focus was on addressing – and challenging – our notion of what clothing is and when a piece is complete. This independence of thought could be seen in Abe’s deconstructed and draped silhouettes. 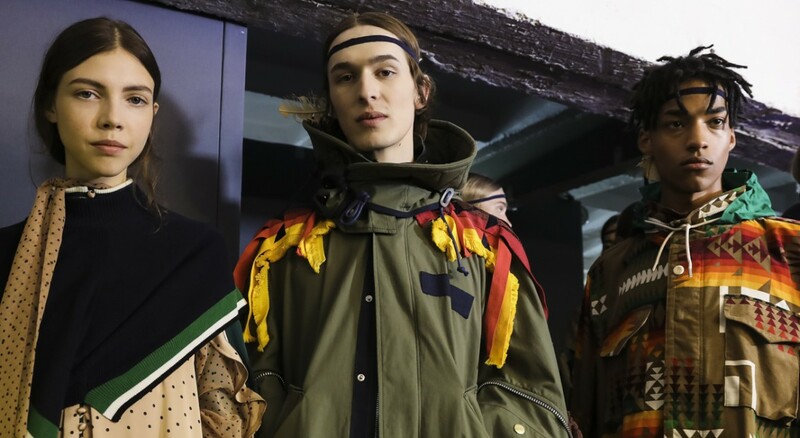 Fabric edges were left raw and hanging loose to create freeform silhouettes, while dip dye treatments only made it halfway down the garment and denim jackets were reinterpreted to sit off the shoulders or paired with elements of checked suiting. The collection was produced with prints in collaboration with Pendleton, known for their production of Native-American blankets. Re-contextualised, they appeared throughout woven and printed indiscriminately. “Drawing on the decreasing relevance of the boundaries of season” – as stated in the press release – Abe explained that she chose to weave fabrics in Pendleton patterns for spring because people associate them with wintertime, and this same pretence cropped up on a T-shirt that saw ‘Spring/Winter’ printed in red text to replace ‘Spring/Summer’ below. Elsewhere, nature-inspired embroideries designed by US tattoo artist Dr Woo punctuated the collection and trainers were produced in collaboration with Nike, adding another play on US design heritage. Skewing our preconceptions of what how a piece should be finished, here was Abe offering a new norm that we can totally get behind.